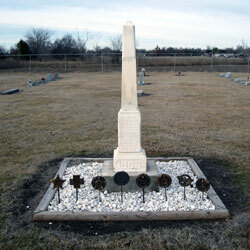 Description: This concrete monument is mounted in a small rock garden. The inscription reads: "G.A.R. ~ Farragut ~ Post No 37 ~ Burrton, Kas. 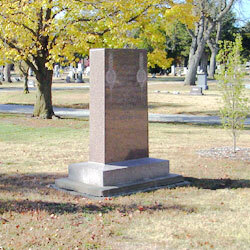 ~ Erected ~ May 30, 1908 ~ In Memory of ~ the unknown ~ dead ~ 1908". Bronze medallions of G.A.R., Spanish War Veteran, World War, World War II, Korea, Viet Nam, and Desert Storm are mounted in front. 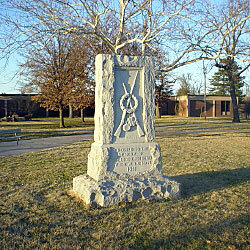 Description: This monument is inscribed: "Burrton Cemetery ~ Veterans Memorial ~ Dedicated to all U.S. Military ~ veterans from Burrton, KS, ~ who have served, are now serving ~ or shall serve ~ Let us not forget their service ~ and sacrifice to the ~ United States of America ~ (Dept of Defense Medallion ~ This Veterans Memorial is funded ~ by the Bob Neuway Legacy Fund". "Halsted Cemetery ~ Dedicated ~ In Memory Of Our ~ Comrades Who ~ Sleep In The ~ Unknown ~ Peacefully Awaiting ~ The Call To The ~ Parade Ground ~ Of Heaven." The base below this inscription is engraved "Country". "Erected By ~ People ~ Of This Vicinity ~ Under The Auspices Of ~ Buford Post ~ No 189 G.A.R. ~ Halstead, ~ Kansas". The base is engraved "Comrades". "Sleep Soldier, Though ~ Many Regret Thee Who ~ Stand By Thy Lone Grave ~ Today. Sleep, Sleep ~ Though The Kindest Forget ~ Thee And Thy Name ~ From The Earth Pass Away". The base is engraved "Honor". "Dedicated ~ To The ~ Soldiers Who ~ So Bravely ~ Offered Their ~ All To Preserve ~ The Union Of ~ States 1861 To 1865". The base is engraved "Our Flag". Description: This monument is engraved: "To the memory of those who died ~ and to honor those who served ~ 1861 * 1898 * 1917 * 1941 ~ 1950 * 1961 * 1982 * 1989 ~ 1990". 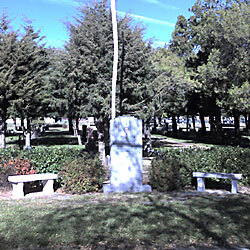 Description: The military Park is located just south of the Newton Library. 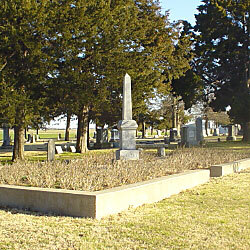 The Monument reads: "1861 - 1865" and "Erected To The ~ Memory Of ~ The Unknown Dead ~ By The W.R.C No 71 ~ 1911". 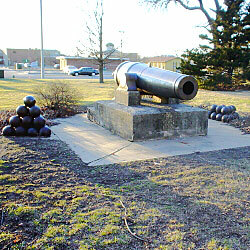 The cannon is on a concrete mount, in the Military Park, just South of the Newton Library. The inscription on the monument reads "1898". 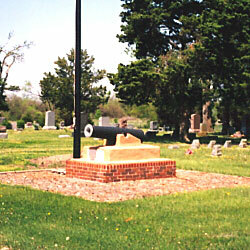 A bronze tablet is mounted behind the cannon. It reads: "Coastal Defense Cannon ~ A Civil War Memorial ~ This Cannon Used In Coastal Defense ~ During The Civil War Was Secured ~ Through The Efforts Of Judson ~ Kilpatrick Post No L 36, G.A.R. And ~ Congressman Chester I. Long, Presented ~ To Mayor George W. Young For City Of ~ Newton By Hon. J.G. Wood, Topeka, ~ On Behalf Of Post No. 36, On October ~ 4, 1899. At This Ceremony "East Park" ~ Was Rededicated "Military Park" And ~ Is So Known Today. On October 5, 1899, ~ A City Wide Celebration And Parade ~ Were Held By The Citizens Of Newton ~ In Honor Of The Dedication Of This ~ Civil War Memorial. ~ Harvey County Historical Society ~ 1977". 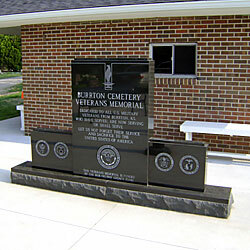 Description: A black granite monument is engraved: "In Memory ~ Of Those ~ Members ~ Of The ~ Armed Forces ~ Who ~ Are Buried ~ At Sea ~ Or ~ On Foreign Soil". Description: A 24-pdr flank howitzer, M1844, is mounted on concrete base with bottom edged in brick. The marble tablet inset on south face of base reads: "Memorial ~ Unknown Dead ~ 1861-1865 ~ 1899".